SOMERVILLE - Mayor Joseph A. Curtatone and the Somerville Board of Aldermen invite residents to attend their local Spring 2012 ResiStat Community Meetings, a twice-yearly effort to share the latest City data and news directly with residents and gather their feedback. Seven neighborhood meetings, one in each ward, will be held in the coming weeks starting Tuesday, April 24th. Mayor Curtatone, Ward and At-large Aldermen, Somerville Police and City staff will discuss issues important to residents-from the latest crime stats and upcoming neighborhood improvements to citywide initiatives including the Green Line Extension, to the City's new data-driven school initiative SomerPromise, the Urban Agriculture Initiative, and more. Light refreshments will be served at a meet-and-greet after each meeting, where residents can talk with City officials and their neighbors. 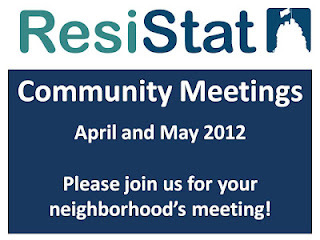 Residents are invited to help shape the meeting agendas by visiting the ResiStat website, www.somervilleresistat.blogspot.com , where they can take the Meeting Survey to propose topics for discussion. Residents may also call ResiStat Coordinator Denise Taylor at 617-625-6600 x2103. Tuesday, April 24, 6:30-8 p.m.
East Somerville (parking available in lot behind building). Tuesday, May 1, 6:30-8 p.m.
Monday, May 14, 6:30-8 p.m.
Thursday, May 17, 6:30-8 p.m.
Tuesday, May 29, 6:30-8 p.m.
Wednesday, May 30, 6:30-8 p.m.
Argenziano School Cafeteria, 290 Washington St.
On rare occasions, a meeting must be rescheduled to allow officials to address unexpected or urgent matters. Residents should always check the ResiStat Calendar at www.somervilleresistat.blogspot.com  to confirm date and time, or call 311 to confirm a scheduled meeting. For more information, visit http://somervilleresistat.blogspot.com  and click the "Meetings" tab, or contact Denise Taylor (email:dtaylor@somervillema.gov; tel. 617-625-6600 x 2103).